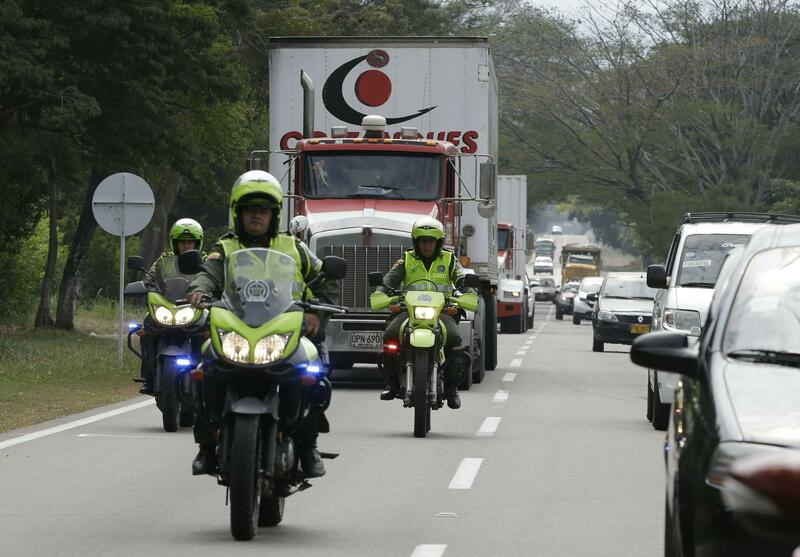 Thu., Feb. 7, 2019, 5:42 p.m.
CUCUTA, Colombia – Trucks carrying U.S. humanitarian aid destined for Venezuela arrived Thursday at the Colombian border, where opposition leaders vowed to bring them into their troubled nation despite objections from embattled President Nicolas Maduro. “The United States is prepositioning relief items – including food, nutritional supplements, hygiene kits and medical supplies – in Colombia so they are available to reach those most in need in Venezuela, as soon as possible,” said a U.S. official, speaking on condition of anonymity because he was not authorized to speak publicly about the issue. A majority of 14 countries in the “International Contact Group” urged Venezuela to return to the rule of law and respect its constitutional institutions – starting with the democratically elected National Assembly. Puerto Rico’s government, meanwhile, said 3,600 pounds worth of donated supplies are en route to Venezuela. Officials have said the aid is not part of the $20 million in aid pledged by the United States. Published: Feb. 7, 2019, 5:42 p.m.